• Banded Mineral Door Core, with Tectonite stiles and rails, maintaining superior strength and durability during the manufacturing process and are up to 25 percent lighter than competitive products in the market. 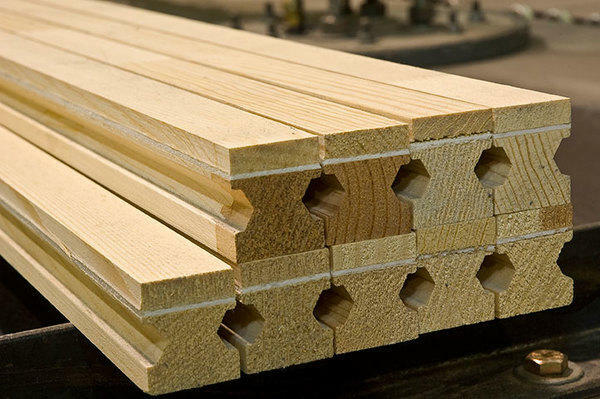 Both generic and customized sizes and configurations are available, either with or without wood edge banding options that include Hem-Fir, Natural Maple, White Maple and Red Oak. • STC/Sound Transmission Door Core, in 60 & 90 minute options. • Mineral Door Core, certified for use with Profile Molded door skins. • Concealed Vertical Rod stiles (CVRs), including CVR-LBR (Less Bottom Rod) meeting edge stiles and Pre-Channeled CVR stiles, can be machined to accommodate most CVR hardware and backsets. If required, we can install wood and/or intumescent on the CVR stiles for Positive Pressure Category-A openings. • Positive and Neutral Pressure stiles and rails are available in a wide variety of species and configurations and may be purchased pre-sized and assembled or in component form. Pre-treatment - all products can be pre-treated to enhance bonding of veneers and door skins. Our pre-treatment solution is compatible with a wide variety of adhesives, including ureas, phenolics, PVA, polyurethane and both reactive and non-reactive hotmelts. Custom cutting and tooling – even mixed orders of various materials can be custom cut to size, sanded and tooled to meet your specified tolerances and configurations. Pre-testing - our in-house UBC-quality test furnace was purchased from Intertek and is capable of simulating a true certification burn test to ensure your uniquely designed products meet any required certification standards. Specialized Fire Rated Products are certified UBC 7-2 (1997) and UL 10(c) (1998), 20-90 minutes as components for fire-rated doors in a variety of openings with all applicable hardware.